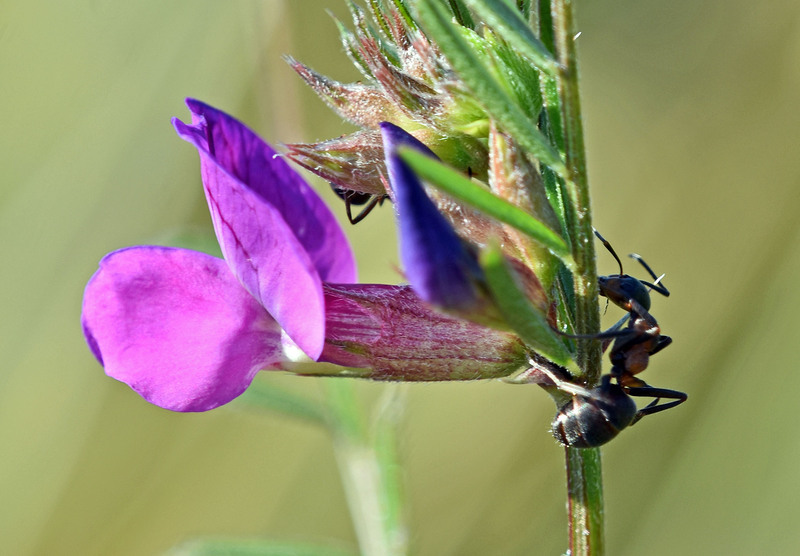 Common vetch plants (Vicia sativa) are much favoured by ants. The reason being that they have tiny glands – called extrafloral nectaries – which produce a nectar solution which the ants imbibe. The plants provide the ants with food and in return the ants protect the plant from being eaten by other insects. A mutualistic relationship. The precise relationship is probably highly variable and undoubtedly more complex than it at first appears. If ant numbers get too high, the plant may in effect be paying too high a price for the protection it receives. Too many bodyguards! Nectar is expensive to make. And if there are no, or few threats to the plants from leaf feeding herbivores, well the plant is paying the ants for nothing. Idle bodyguards! And boy do they like their nectar! The ants benefit in two ways: they get nectar from the plant and they also get to eat (some of) the herbivores they find on the plant. Others they just throw off the plants. More bouncers than bodyguards (or plantguards). The plant also benefits in a number of ways; it suffers less feeding damage and it sets more seeds (probably because fewer get eaten thanks to the bodyguards!). Ants undoubtedly do their protection job well, and remove external feeders such as caterpillar larvae. When the nectaries were artificially removed from plants by scientists, the ants stayed away and the vetches suffered more leaf damage. So not surprisingly, this investment – in providing food for the ants – pays off for the plant. But there are some insects that are either too tough for the ants to remove (some weevils) or have found ways of avoiding these ‘pugnacious bodyguards’ (a wonderful terms coined by Bentley ). The purple glandular nectaries are found on stipules which occur at the base of the leaf petiole. Ants can be seen with their heads in the hood-shaped stipules, feeding on the glands inside, in these photos which I took in Spain (Galicia). 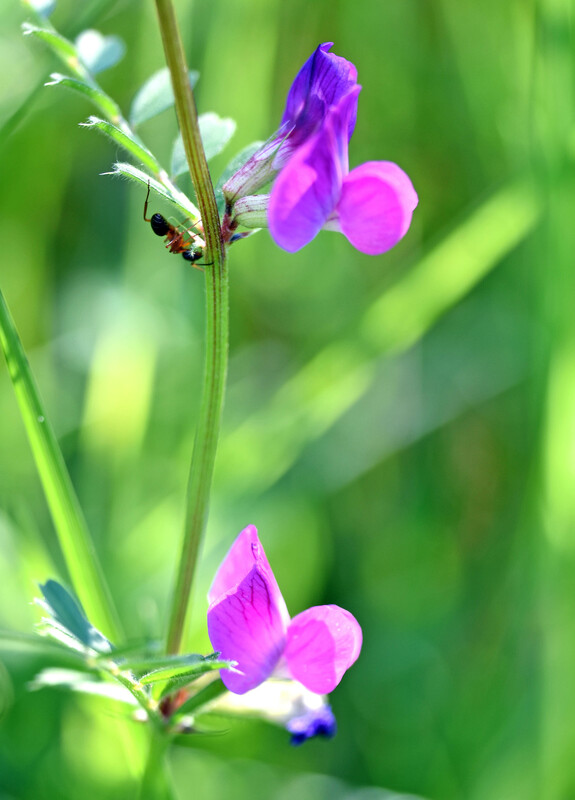 I don’t know what the ant species are, but I think this is narrow-leaved vetch (Vicia sativa ssp. nigra) which occurs in coastal areas. 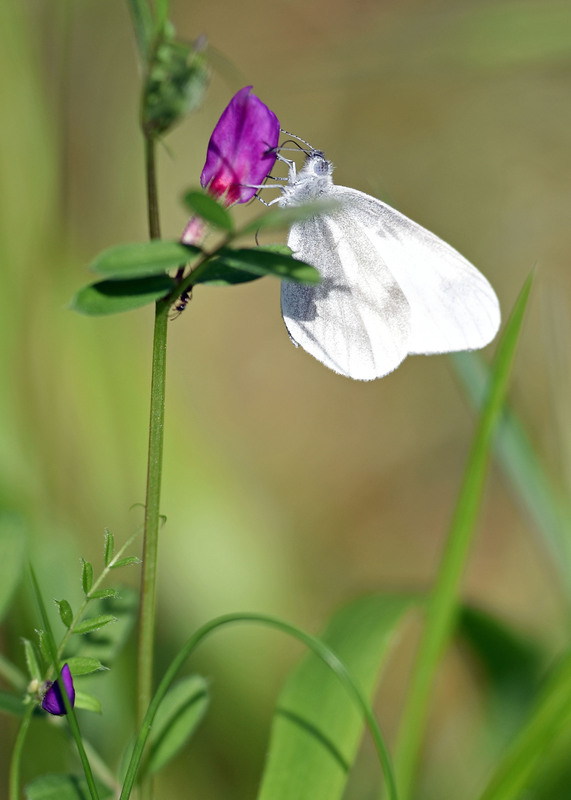 Common Vetch is not a host plant for the little Wood white butterfly (Leptidea sinapis), perhaps because the ants would throw the caterpillars off the plants or eat them! But that does not stop the adults dropping in for a sip of nectar from the flower (above). These photographs were taken at Morouzos Beach (playa de Morouzos in Spanish), Ria Ortigueira, Galicia, Spain (https://rcannon992.com/2014/10/28/morouzos-beach-a-unique-and-fragile-dune-habitat/). Koptur, S., & Lawton, J. H. (1988). Interactions among vetches bearing extrafloral nectaries, their biotic protective agents, and herbivores. Ecology, 278-283. Koptur, S. (1979). 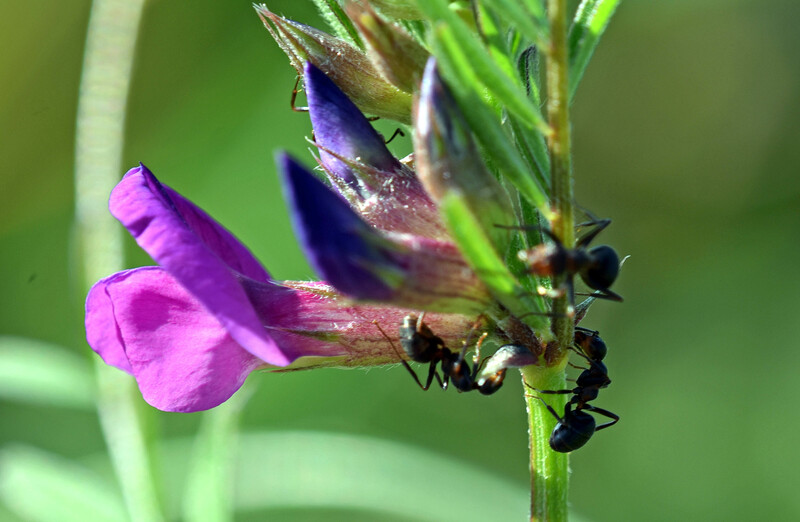 Facultative mutualism between weedy vetches bearing extrafloral nectaries and weedy ants in California. American Journal of Botany, 1016-1020. Koptur, S., Smith, C. L., & Lawton, J. H. (1996). Effects of artificial defoliation on reproductive allocation in the common vetch, Vicia sativa (Fabaceae: Papilionoideae). American Journal of Botany, 886-889. Bentley, B. L. (1977). Extrafloral nectaries and protection by pugnacious bodyguards. Annual Review of Ecology and Systematics, 407-427. Next Next post: Smiles like a reptile! What species of black ant? I’m not sure. Lasius niger perhaps. Thank you so much for this post! I’m currently painting a botanical of V. sativa found here in Seattle and I would have left that “mysterious” dark spot of nectar completely off if it weren’t for you! Glad to hear that it was useful to you! Ray Cannon's nature notes Be my bodyguard and have a drink! 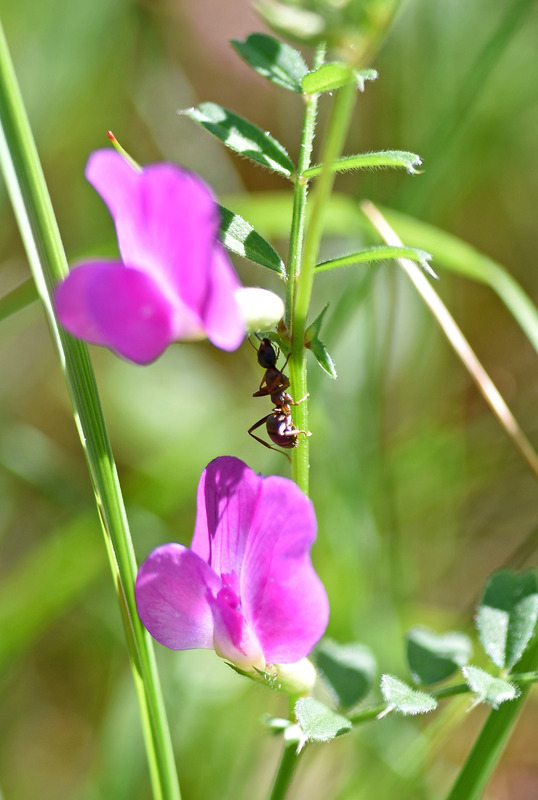 Said the vetch to the ant.